BACK in the 1980s all families who had the luxury of possessing a television set got together to watch India’s first soap Hum Log. They waited patiently to see weekly episodes of serials like Hum Log, Nukkad, Buniyaad and more. Then came the two epics Ramayana and Mahabharata, which completely changed how people viewed television shows. Two decades later the small screen is no longer small by any stretch of imagination. It has metamorphosed into a national obsession. More than 200 channels with more than a 2000 hours of original programming everyday and a combined viewership of over 57 million, makes the Indian television network one of the largest in the world. So widespread has been its influence that it has penetrated into every nook and corner of the country cutting across demographic and geographic barriers. Indeed the coming of satellite channels in the early 1990s has completely changed the face of Indian television. Entertainment channels like Star, Sony and Zee have launched several shows and serials that have gone on to attain dizzy heights of popularity. With the increase in the audience base there came a change in the viewing habits. The most important being the perception of the star system on the small screen. While the earlier serials spawned famous characters like Lajoji (Buniyaad), Ghansu (Nukkad), Badki and Nanhe (Hum Log), hardly anyone knew the stars who brought these characters to life. The characters became immortal though the actors were forgotten. But the 1990s changed that a bit with the arrival of stars like Mandira Bedi, Kitu Gidwani, Shekhar Suman and Pankaj Kapoor who went on to garner personal publicity. Ekta Kapoor revolutionised the concept of viewership. She made the characters larger than the serial itself. The first example was Smriti Irani (aka Tulsi) of Kyunki Saas Bhi Kabhi Bahu Thii. She along with Amar Upadhyay - her onscreen husband Mihir - mesmerised audiences and the two became the first poster couple of the Indian television. 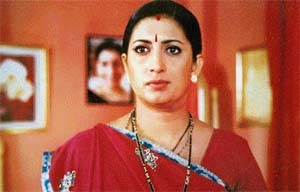 Smriti Irani went on to become the highest paid television artiste in India. Her character Tulsi Virani became larger than the serial itself and now the whole story revolves around her character. The legacy of Mihir and Tulsi has been carried forward by Hiten Tejwani and Gauri Pradhan who became the hottest couple on the small screen and their serial Kutumb was an instant hit. It was the first time when people talked about the great onscreen chemistry of a television pair. Together they also worked in Kyunki Saas Bhi Kabhi Bahu Thii and their ardent fans have continued to love them in every role they have done. Like Hiten Tejwani, another actor Rajeev Khandelwal has become a superstar of the small screen with Ekta Kapoor’s Kahiin To Hoga. Many call him television’s Shahrukh Khan as he has a huge female fan following. Such was his appeal that the negative character he played in the serial was turned into a positive one. Vikas Bhalla, too has a huge female following. His serials Tum Bin Jaoon Kahan and Meet have turned him into one of the most sought after stars of the small screen. When it comes to popularity, Varun Badola must also come up trumps after his heart touching role in Koshish`85Ek Aasha. Known for his acting skills, he has delivered some big hits like Astitva`85Ek Prem Kahani and Des Me Nikla Hoga Chaand. Women too have a star system all their own on television. Sangeeta Ghosh is the reigning queen actress who sets the small screen on fire with her unconventional looks. With hit serials like Des Me Nikla Hoga Chand and Viraasat she is every man’s dream.